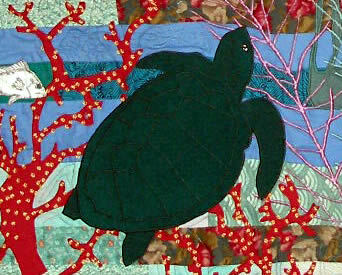 Thirty fish, two kinds of jelly fish, many corals, octopus, sponges, a sea horse and a turtle. The instructions for this pattern explain how to add 3-D effects, in addition to the basic directions. Silver lamé is included for the eyes and some small fish. 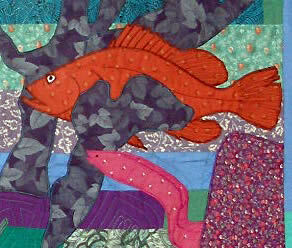 The quilt above, which is on the pattern cover, measures 37" x 42". 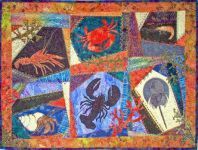 You could easily make this a king sized bed quilt like the one I made in 1997 with this pattern. 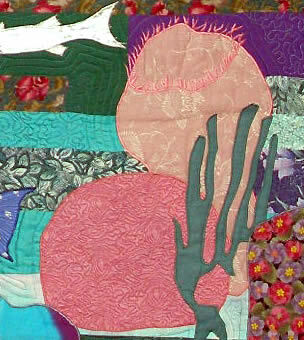 The top of the bed part of the quilt was divided into three sections or panels with a small border. 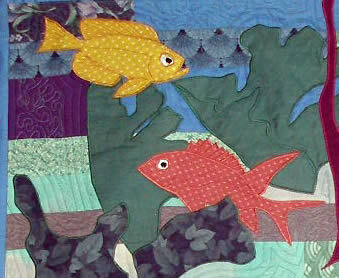 The part of the quilt that hangs over the edge of the bed had the fish going horizontally, so when you view the quilt from the room, the fish are all happily swimming in a huge ocean, not diving into the floor. I put an octopus (included in the pattern) on both corners at the bottom of the bed. I thought you might enjoy this video from YouTube. In 2016 I used this pattern with wool and needle felting, making additional instructions and a 11" x 17" cover page printed in color on both sides. It is called Woolly Fish. This denim shirt was decorated by Monica Rich. 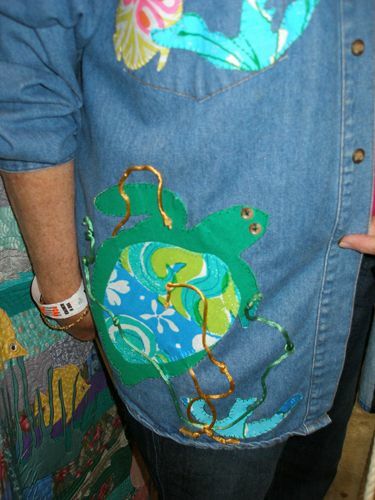 This denim shirt was decorated with tropical fish by Monica Rich.